This week - 28 October to be precise - was the 100th birthday of the British painter Francis Bacon. He was a driven man whose uncompromising, energetic and powerful pictures matched his famously tragic and extreme lifestyle. Bacon was the most important painter in Britain during the 1960s and 70s. His big, powerful canvases demand the viewer's attention and never leave you untouched or ambivalent. At a time when abstraction was all the rage, Bacon - a more-or-less self-taught artist - pushed the figurative to its boundaries and with it the human form. Almost all of Bacon's works focus on one or two people and he had a fascination for the human mouth and the body in motion. 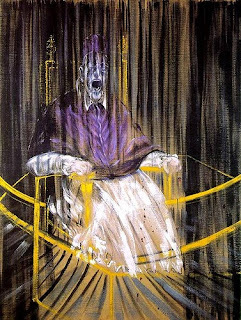 The gaping mouths of the Pope pictures he painted during the 1950s spectacularly reflect his oral fixation. Based on Velasquez's portrait of Pope Innocent X (1650), these are some of the best known Bacons. His predilection for the body in motion was fostered by Muybridge's 1887 book The Human Figure in Motion. David Sylvester's book Interviews with Francis Bacon is still one of the best books on twentieth century painting. One thing is for sure about Bacon's paintings, you won't find many on corporate boardroom walls! And that is a good thing.